Ok, so I guess this is the place where I lay out a little about who I am and what I'm trying to achieve. I think the 'technomadic' buzzword means different things to different people. Some folks think it means to call the internet your home address, and wander free - I can get behind that, at least somewhat, and in fact have made that particular point the focus of my profession. For a day job, I currently work pretty much exclusively with 'cloud computing', a branch of network virtualization that makes server technology hands-off and incredibly scalable. So what have I done so far? Well, when I began this blog in June of 2008, I was working a systems administrator for a small ISP in North Vancouver, commuting the 15km or so by bicycle every day from my basement apartment in East Van. Now I work for an international media firm, who produce web properties for large clients, with our largest client being the owners of several large, popular celebrity gossip sites. I live full-time on 'TIE Fighter', my 11-meter sailing trimaran, anchored at the time of this writing in False Creek, with a gorgeous view of downtown Vancouver. Am I achieving my goals? Yes. Am I happy? Yes. Am I finished my adventure? Not by a loooooooong shot - and even now, as I write this from a cold berth under a gray, rainy Vancouver sky in March, with my water supply tainted and my stove broken, I know that I'm doing exactly what I should be. There can be no growth without change, and change is never comfortable. Here's to change. Thanks for reading my blog. Hi! Just found you and your girlfriends blog on Cruisers Forum. Go You!! love it. Hi! My boyfriend just forwarded me your blog and I’ve eagerly read through your last dozen posts about your sailing adventure. This is awesome, I’m excited for you both! It’s been my dream since college to move aboard and go cruising. I’ve taken a few sailing courses and last year my boyfriend and I bareboat chartered a 35 foot cat in the Whitsundays. It was one of (if not the) coolest experience I’ve ever had. We learned so much about the ocean in one short week! Currently I’m living in Carlsbad, a small town north of San Diego. If you’d like, and have any extra time when you make it down to SD, shoot me email. 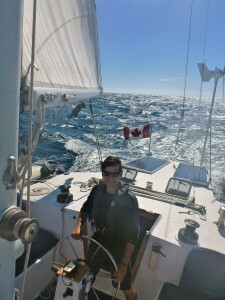 My boyfriend (Kirk) and I would love to meet up with you for a beer and talk sailing.